The Qualcomm Snapdragon 410E processor is now available as a certified rhomb.io core module that can be used with your rhomb.io motherboard. It has been developed with IoT and embedded computing in mind, with a particular focus on smart homes, building automation, industrial control, digital signalling and smart surveillance devices. 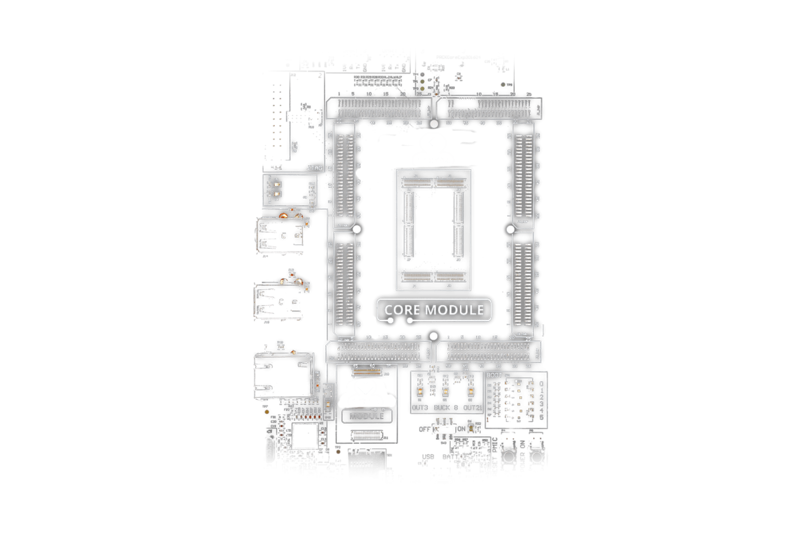 This core module integrates increasingly complex functions while providing high performance, rich multimedia, low power consumption and offers support for multiple operating systems. The main characteristics of this module are its full integration and control of essential functions like CPU, GPU, RAM and power management. Users who incorporate this processor will find the only other hardware they will need is a power source and a mass storage module with an installed operating system. The Snapdragons high performance is achieved by the four ARM Cortex A53 cores running at 1.2GHz, based on the architecture ARMv8-A, that offers an efficient 32-bit and 64-bit instruction set. The memory options include 1GB or 2GB high efficient LPDDR3 @ 533MHz. The processor embedded in the SoC is the Adreno A306, the GPU is efficient and works at 400MHz with support for multiple APIs including OpenGL ES 3.0/2.0/1.1, OpenCL 1.1e for Android and DirectX 9.3 for Windows 10. This core can manage MIPI display with resolutions up to 1900×1200 and HDMI displays up to 1080p. The Miracast protocol is also supported, with resolutions up to 720p. Tasks involving signal processing are controlled by the Hexagon QDSP6 v5 core. Working at 691MHz, this DSP can handle significant compute workloads for image processing applications such as virtual reality, augmented reality, image processing, video processing, and computer vision in a very efficient way. In addition, the core works inside the SoC as a low power island for “always on” sensor-aware applications. Two MIPI-CSI interfaces allow the Qualcomm Snapdragon 410E core to support two cameras. The integrated Image Sensor Processor is capable to work with images up to 13MP, and the multimedia features include 1080p video capture at 30 FPS and H.264 Codec playback. Unlike other Rhomb.io Cores, the Qualcomm Snapdragon 410E processor module integrates full Wi-Fi and Bluetooth interface with its own antenna connector. No external circuits or modules are required to provide wireless connectivity to this Core, making it particularly suitable for IoT and portable designs. The power solution for this core processors is provided by uOMIC, a power management micro-module by TNFG. The uOMIC generates all voltages needed by the SoC, the memory and all other ICs in the Core. It also delivers multiple LDOs and BUCKs rails that can be used freely by the designers and users to power any other circuits on their motherboard designs. The Qualcomm Snapdragon 410E core shares two more characteristics with all other Core Modules in Rhomb.io Ecosystem: a 1-Wire factory-programmed ROM (with a unique 64-bit ID number) and a crypto-authentication device that ensures that the core and the firmware it runs are not cloned, counterfeited or tampered with. Finally, the versatility of this core is reflected in its multiple operating system support: Linux, Android and Windows 10. If you would like to learn more about this core module and how it could function with your device, you can contact our technical team here.